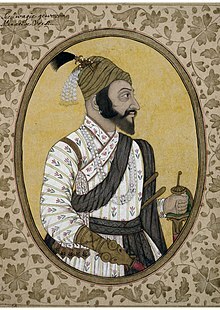 Shivaji Bhonsle (Marathi [ʃiʋaˑɟiˑ bʱoˑs(ə)leˑ]; c. 1627/1630 – 3 Aprile 1680), an aa kent as Chhatrapati Shivaji Maharaj, wis an Indian warrior keeng an a member o the Bhonsle Maratha clan. ↑ 1.0 1.1 Indu Ramchandani, ed. (2000). Student’s Britannica: India (Set of 7 Vols.) 39. Popular Prakashan. p. 8. ISBN 978-0-85229-760-5. ↑ Raṇajita Desāī; V. D. Katamble (2003). Shivaji the Great. Balwant Printers Pvt. Ltd. p. 193. ISBN 81-902000-0-3. This page wis last eeditit on 22 Juin 2016, at 17:36.